Designed by Heri and Salli, 'Office Off' is an office concept that says "why shouldn't work be fun?!" The design of this EC centre is reminiscent of the contemporary or "late modern" institutional approach. 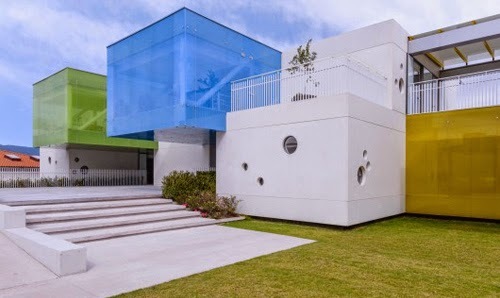 While perhaps a tad too sterile in my opinion, the architecture does exhibit fine detailing and craftmanship and some fun and playful characteristics. 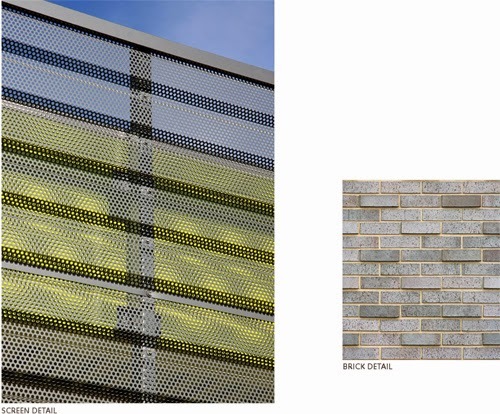 "White-washed" precast concrete panels are paired with coloured semi-transparent glass facades. 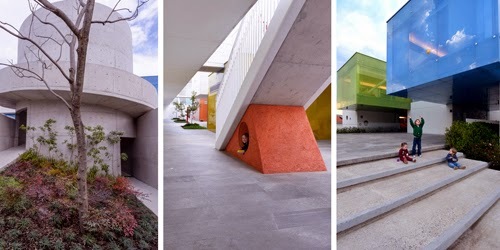 The architects (LBR + A) taking thier inspiration from stacked toy blocks. 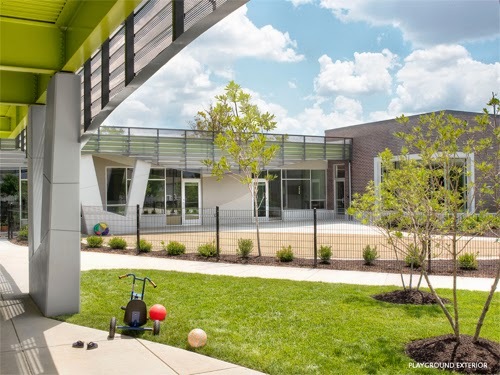 Limited space (the kindergarten shares the site with an existing primary and elementary school) meant combining ground play areas with elevated terraces. 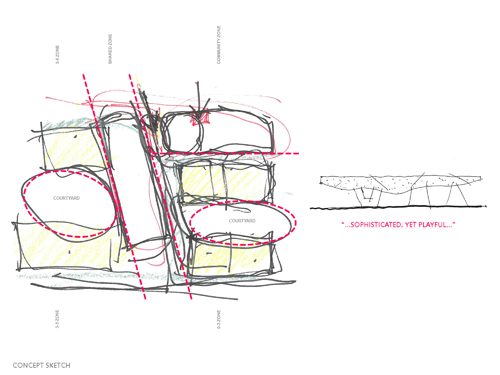 Circular windows of varying sizes, shallow atrium stairs (for sitting or performing) and a range of regular, curving and irregular paths and forms work to create spaces for play and exploration. 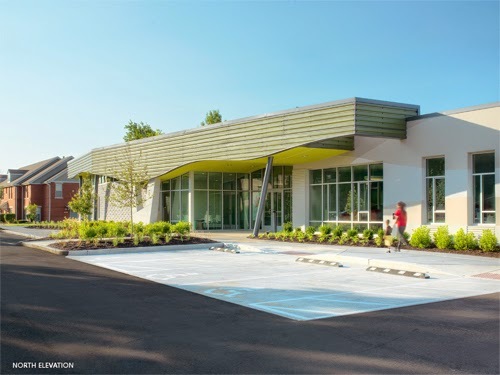 The Flance Early Childhood Center in St Louis, Missouri has recently been completed. 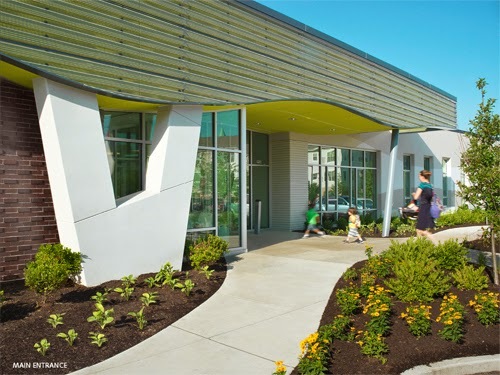 Designed by Trivers Associates the centre demonstrates a high quality build and an emphasis on promoting a healthy community. The centre, offering a community garden for all to look after and enjoy not only reaches out to the wider neighbourhood but teaches children about nurturing natural life and then enjoying healthy eating. 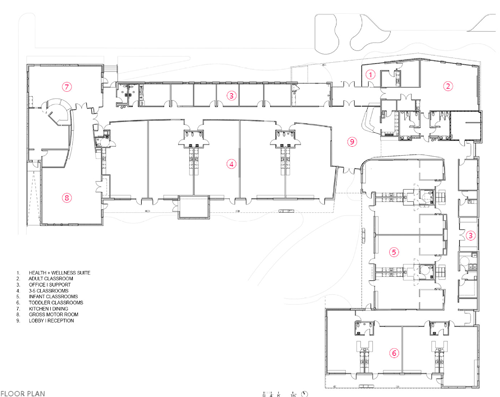 The kitchen and dining areas (number 7 in the plan below) has been designed as a space for "demonstrations" - showing children and their families how to create delicious healthy food. Whilst a "wellness and community classroom" (number 6 above) is another facility that caters for the wider community promoting wellness and acts as a space for hosting community events. The building's design combines an approach that is both serious (or sophisticated), yet has an element of fun and lightness. 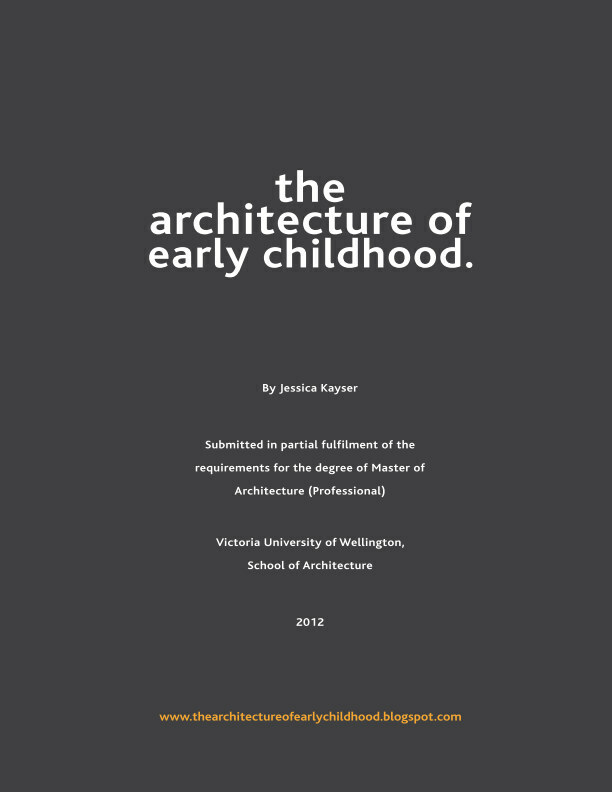 The diagram below shows the architect's consideration into how the current areas buildings might better cater to children's needs. 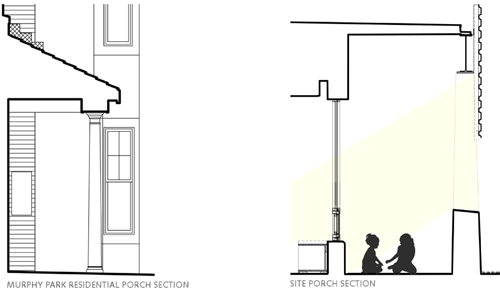 The designed porch providing a connection between inside and out, whilst acting further as a transitory space for play. 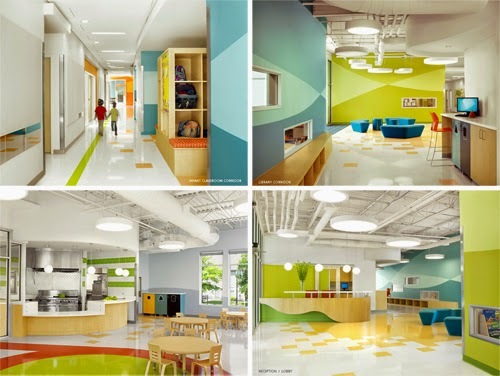 Inside a select colour scheme and surface graphics serve to define boundaries and space, while injecting fun and play. Outside the dynamic porch balcony, playful feature structural columns, landscaping, colour and material palette (including perforated steel and protruding bricks) combine to create a thoughtful and considered design for it's young users and the wider community.